UK-BASED TOSIN HARMONY (MR SHALOM)! 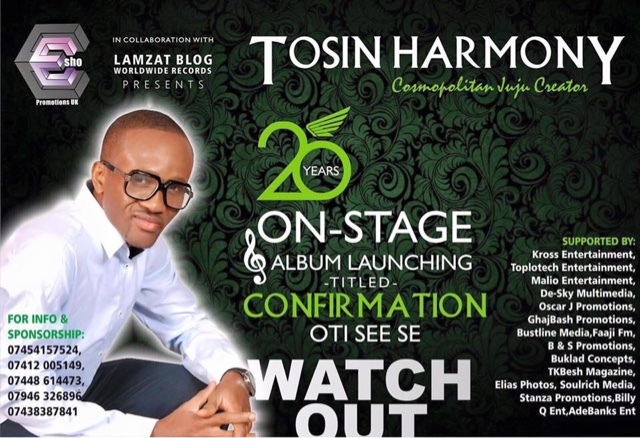 Nigerian-born UK Juju musician, Tosin Harmony is set to celebrate his 20 years anniversary on stage with a line up of events both in the UK and Nigeria! Here are some facts you should know about the musician. Currently the hottest and the most sought after Juju musician in the United Kingdom. He is a versatile composer with an endless repertoire. His brand of Juju music is Cosmopolitan and appeals to all and sundry. Jolly music is his logo. He was born Oluwatosin Ayodele-Ekemode at a CAC church in Lagos. Tosin Harmony, also known as Mr Shalom, started singing in the church choir at the age of 5. He was admitted to the University of Ibadan to study Law but later switched to Political Science following clashes between studying and focusing on his musical career. He is an Ijebu-Ijesa indigene of the Yoruba tribe. He is also a relative of legendary Juju musician, IK Dairo. He has worked with top Juju musicians including Sir Shina Peters, Yinka Ayefele and Wale Thompson. He once played the drums for veteran gospel singer, Funmi Aragbaiye. His upcoming album is titled ‘Confirmation (Oti Seese). Tosin Harmony also works as a HR Practitioner in the UK. He just released a new single ‘Lelefe’ which is a bonus track off the upcoming album.